It’s LIVE! Gods of Anthem is LIVE! Oceans apart, a young musician and a “special” soldier embark on a perilous journey for home fueled by the unyielding pursuit of freedom from the Authority. To strike back at the new world order, the troubled son of a preacher, Thomas Ripley-Hatter, suffers unspeakable alterations by the Underground to join a secret Army. Tommy knows that all hope lies in human-weapons like himself, and that somehow he must cling to his sanity…while letting loose the monster to win. The battle begins for the last-standing sliver of humanity: Anthem. Gods of Anthem has already become an Amazon Best Seller in the US & UK! 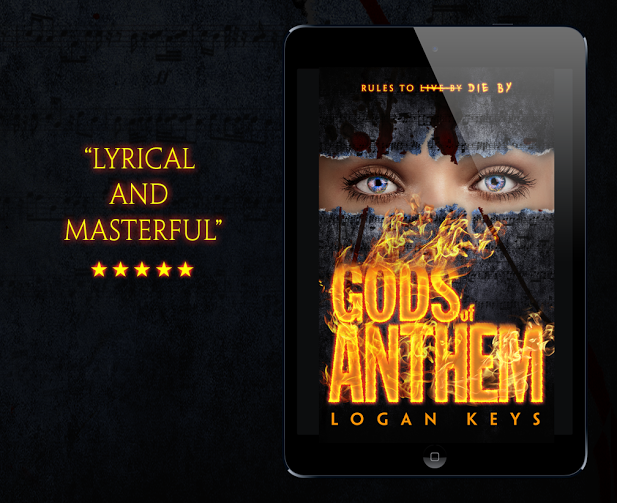 Gods of Anthem by Logan Keys ~ Now available!